Press the (TRIP) knob to change the display. Shows the total number of miles or kilometers driven since the last reset. Meters A and B can be used to measure two separate trips. To reset a trip meter, display it, then press and hold the knob. The trip meter is reset to 0.0. Press and hold the km/mile change knob to switch the measurement. 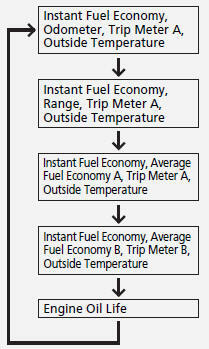 Shows the instant fuel economy as a bar graph in mpg or l/100km. Shows the estimated distance you can travel on the remaining fuel. This distance is estimated from the fuel economy of your previous trips. Shows the outside temperature in Fahrenheit (U.S.) or Celsius (Canada). Adjust the temperature reading up to ’ 5’F or ’ 3’C if the temperature reading seems incorrect. 2. Press and hold the (TRIP) knob for 10 seconds or more while the outside temperature is shown on the information display. The information display goes into temperature adjustment mode. The display starts showing from -5’F to +5’F (U.S.) or -3’C to +3’C (Canada). 3. Release the knob when the right adjustment amount is shown. The temperature sensor is in the front bumper. Road heat and exhaust from another vehicle can affect the temperature reading when your vehicle speed is less than 19 mph (30 km/h). It may take several minutes for the display to be updated after the temperature reading has stabilized.